In the movie “Captain Ron”, Kurt Russell’s macho character exclaims “If it’s gonna happen, it’s gonna happen out there!” We’ve spent enough time in Block Island’s New Harbor to know that if it’s gonna happen, it’s gonna happen at Block. Nearly every visit to Block, and mind you we only make one visit a year at most, contains an “event”. Back in our power boat ownership days (hey we’re not perfect) as well as our stop last year with Ortolan we had fun happenings such as 1) being awakened at 2am by the nearest boat shouting that we’d dragged- nope had a stern anchor out to keep us from swinging into too shallow water, thus not swinging like our neighbors. 2) the launch gouging a hole in the hull below the rub rail (but they paid for the repair) 3) major anchor windlass difficulties and 4) departures relayed by blankets of fog. The wind promised much this day yet wimped out by the last third of the trip. Narragansett Bay and Block Island Sound offer scenic sailing in moderate winds at least in summer. Sailing along about 10 miles from Block with all 3 sails up, I was sitting on the tramps, we spotted a blue Cessna-type plane flying very low. He came over our bow and around us a couple times. Um… large letters in white covered the wings but we didn’t get a good look. Taking pictures? Oh wouldn’t that be nice? I so want a picture of us sailing and this would have been one of the rare times we flying all 3 sails. The harbor was busy and we finally anchored in 51′ just off the channel in the NW quadrant. Way more depth than we like to or ever anchor in, we put out 225′ of our 250′ of chain with the nearest boat a safe distance away. Not for long. We’re joined by another a bit too close for comfort. Block seems to usually have more wind than 5-10kts and so it did for our two day stay. We hoped it would be our friend and keep all boats taut on their rode and swinging in unison. Oh, don’t laugh at my foolish wish! Our real wish and reason for a detour to Block is the absolutely deliciously mouth-watering Killer Donuts sold in Smugglers Cove (used to be right at Payne’s but they moved). The secret ingredient- who knows? I do, but will never tell. I will confess to consuming 3 (the guys had more!) and saving one for the following day. A walk for groceries eased MY guilt. 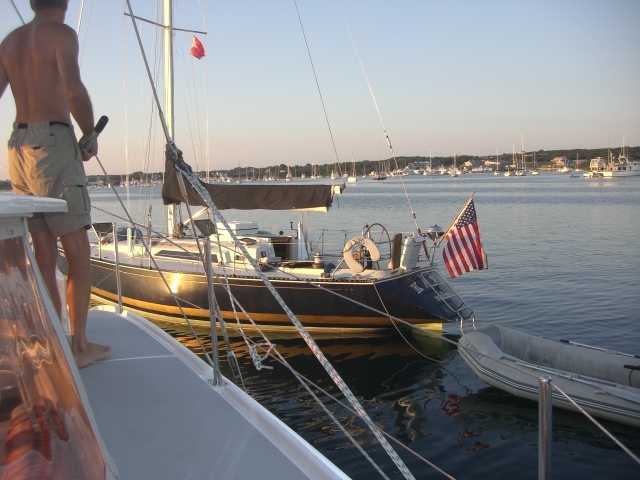 Wednesday, besides the donuts, was eagerly awaited as we hoped to see Panorama, Maine Cat hull #20 and Bella Vita a Dragonfly 1200 whose owners Phil and Marcia had contacted us and Panorama (we’re all in CT) about taking a look at our Maine Cat. Dragonflies are center cockpit trimarans with amas that retract. Oddly enough, we all were headed toward Block. We arrived on Tuesday and watched the others arrive on Wed. We delighted in watching Panorama since as our twin she was how we looked to others. Even had a blue sail cover. We enjoyed a nice chat with Bella Vita. They are in the very early stages of a new boat search, so hard to say where Maine Cat stands in the running. Poor Panorama. Lara and Scott and their 3 little ones had an awful start to their month long vacation. Their jib and screacher were torn to tinsel-like shreds shortly after leaving their mooring to begin the trip. They’d gotten caught in a 50kt T-storm; only able to drop the main in time. Why they had all 3 sails up with a storm coming is beyond me. While Russ and Benj visited the beach I kept Ortolan company and worked on the new blog. Wouldn’t you know it, a monohull anchors on our port side between us and another boat. Close but Ok as long as the wind stays from the SW at 10kts. Fast forward to 6am when the dreaded thud occurs. We know the drill and I can feel how calm we’re floating in the water. Jump up, toss on clothes, Russ heads to the bow and I grab the boat hook. The stern BBQ grill of the newcomer was trying to mate with our starboard bow. Pushed off and watched as it moved away, occupants still sleeping. With 225ft of chain and with no wind to keep us held taut, we can cover plenty of ground when the wind dies. Was only a matter of a few minutes until our neighbor would swing back; sure enough here she comes, we fend off, the owners arrive on deck to be briefed of the situation and state they have 225ft of line. Once properly in place (they to our port and us with nothing between us and the channel) what else to do but raise the anchor and head off? Only an hour early. No fog to hold us back for once. Where’s Benj? Still in bed as any proper teen would be. Any slumber would soon end as the anchor chain was raised, some of it twice. The windlass began to complain when the chain got piled up against the fenders that Russ moved to the chain locker to work on the watermaker in the other bow locker. Suddenly, all the chain drops back into the water. Russ tends to the fenders in the locker. Try again and off we go. With such an early start we’d get through the Race at the western end of Fisher’s Island before the tide changed. Alas, no mildew covered sails raised for this trip. Wind right on our nose, what little there was. We frequently experience a positive for every negative. No sailing was partially offset by a- get this- turtle sighting just past the Race. He was big- at least 3ft with a head 6-7inches long. Right in our path(munching on jellies possibly), had to swerve to avoid him. He stayed near the surface for 5mins then we lost sight of him. Loggerhead perhaps; couldn’t find a good enough match online to say for certain. This entry was posted in Uncategorized and tagged anchor, east coast fun. Bookmark the permalink.